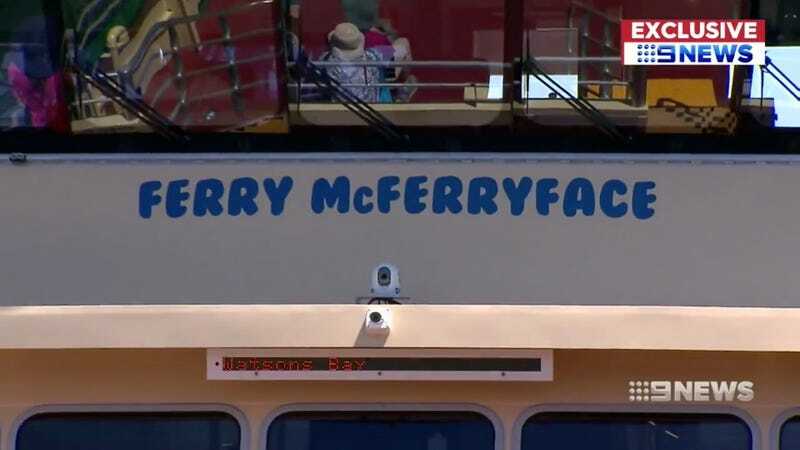 When Sydney, Australia decided to have a public vote to name a new ferry, there were worries that residents might choose something ridiculous. So when the winning name was announced as Ferry McFerryface, most people (including us) assumed that it was just another stupid vote gone wrong. But that’s not what happened at all. It turns out Ferry McFerryface didn’t actually win. A local politician, Transport Minister Andrew Constance, just decided to override the vote and name it that anyway—all in the spirit of other naming “disasters” like the British research vessel named Boaty McBoatface. Not only did Ferry McFerryface not win, Constance blamed the public when people complained about the stupid name. To top it all off, he seems to have wasted about $81,000 ($100,000 AU) on the naming competition in the process. Documents obtained by Nine News Australia show that the real winner from the public vote was the name Ian Kiernan. Kiernan is one of the founders of an environmental group called Clean Up Australia, and it should have been his name on the new ferry. Ian Kiernan received 2,025 votes compared with just 182 for Ferry McFerryface. Other possible ferry names that got more votes than Ferry McFerryface included people like Australian author May Gibbs and the architect of the Sydney Opera House, Jorn Utzon. All of this news only came to light through freedom of information requests made by the local news. When the name was announced back in November, Transport Minister Constance tweeted as though his hands were tied and there was nothing he could do. He said that while Ferry McFerryfacce wasn’t “everyone’s cup of tea,” the “people voted for it.” It turns out that was a lie. Today, Constance told Nine News that the name Ferry McFerryface allowed the ferry to get “global attention” and was just “fun for the kids with selfies.” And he’s certainly right. It did get global attention, despite the origin story being completely fabricated. But it appears that the local government is embarrassed enough that they’re going to change the name. Not to the name of the environmentalist who actually won, mind you. The ferry is actually one of six in the new fleet, and the other five were named by the government: Catherine Hamlin, Fred Hollows, Victor Chang, Pemulwuy, and Bungaree. Ferry McFerryface will soon become the May Gibbs. But why not name it after the real winner, environmentalist Ian Kiernan? That’s a great question, but we can only speculate at this point. On a completely unrelated topic, the Liberal Party of Australia is roughly equivalent to the Republicans in the US. May Gibbs died in 1969 and was a tremendously successful author of children’s fantasy stories in Australia, including 1918's Tales of Snugglepot and Cuddlepie and 1929's Bib and Bub in Gumnut Town. So it seems kind of silly that Mr. Constance would go to the trouble of sabotaging the vote with something like Ferry McFerryface. Snugglepot, Cuddlepie, Bib, and Bub, all sound like perfectly goofy names to use for ferries. And I guarantee that the entire Thingy McThingyface is passe in 2018, even with those selfie-snapping teens and other ne’er do wells. Dollars to donuts they’ll take a selfie with Snugglepot or Cuddlepie any day. It’s far more dignified.